So when I started mixing my own fish sauce, I went by the (cook)book. I filched recipes from Mai Pham’s Pleasures of the Vietnamese Kitchen and from Bach Ngo’s The Classic Cuisine of Vietnam, and used the same proportions. Invariably, though, the result ended up tasting really bad, and I ended up having to top up ingredients in a frantic attempt to get the taste and colour back into familiar ranges. I thought it was further proof of my lack of talents at cooking–until I read this article on Andrea Nguyen’s Viet World Kitchen blog, on how to buy fish sauce. 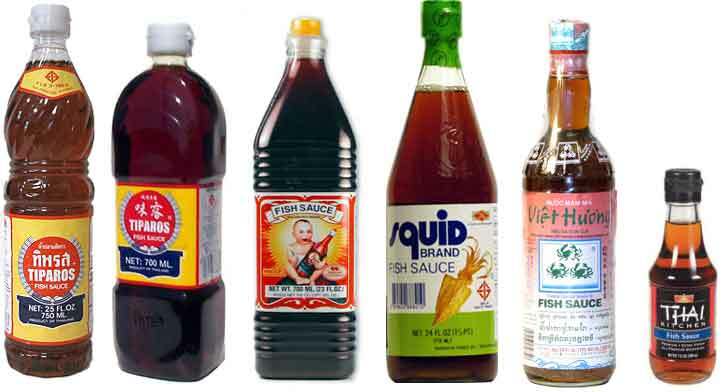 Down near the middle, there’s a note that says that fish sauce sold in the US is single-grade–with an average of 20°in purity (ie, 20% pure fish concentrate, 80 water). But, see, in France, unlike in the US, fish sauce comes in several grades–25° or 35°. And my mom, my grandma and I (and most Vietnamese) buy 35°. So basically, I’ve been trying to get proportions right with the wrong kind of fish sauce, and all the quantities of those recipes should be adjusted by 20/35 (which is about 60%).